The Welsh-raised, London-based the Joy Formidable turned heads last year with The Big Roar. This year, the roar is even bigger as the trio releases Wolf's Law, which adds confidence to the already convincing mix of brisk and dangerously addictive alternative rock dished up by Ritzy Bryan (vocals, guitar), Rhydian Dafydd (bass, backing vocals), and Matt Thomas (drums, percussion). Producer Andy Wallace (Nirvana, The Misfits, Avenged Sevenfold) deserves props too. The vocals and guitar were recorded in Maine. The drums, orchestra, and choir were added in London. No one would ever know it based on what they laid down — 11 tracks with all the veracity of The Big Roar albeit with much more polish. This wasn't written in retreat like previous outings. It's grand, grown up, and without any dirt. In doing so, the Joy Formidable took on a new risk as the grit is what attracted plenty of people before. The Joy Formidable grows up with Wolf's Law. Despite the more commercial aspects of the album, with simplified songwriting, the Joy Formidable has kept everything that counts. The guitars still buzz. The percussion still pounds. Everything is preserved that makes this surging power trio stick, right down to the diversity of Bryan's vocal delivery. The Ladder Is Ours, which opens the album, is a prime example. It starts with an easy orchestral open that winds up everything tight before the band breaks into the bristling, loud, and strangely beautiful and dreamlike qualities of Bryan's voice. The song teeters between soothing and unabashed. The video, like any released by the band in the support of the album, is a big production like the music. Cholla is even better, with a bigger and bassier foundation. It fits the lyrics, the breakdown of a relationship that has hit a standstill. Cholla also nails one of the aspects of the band that continues to make them a standout. As the song barrels ahead, the trio tightens it all up midstream by dropping everything back to a near silent status. The whisper of it is as powerful as the big sound they deliver. So where are they going? Big. After pulling back on Tendons and Little Blimp, Bats powers up simple lyrics and a bipolar instrumental. It's one of the more underrated tracks on the album, partly because the lyrics are so repetitive, but it;s the heaviness behind it that brings the band closer to the abruptness that ensures they don't sink into any sameness. The growing diversity in their arsenal rocks and rolls. On the other end of the spectrum is Silent Treatment, with Bryan quietly sharing a lullaby of the song. Hearing it live is even more powerful because the acoustics are so much more pronounced, but the studio session still captures the folk-like qualities of a song about how much someone is willing to take and still hang on. Silent Treatment is a remarkable track to usher in Maw Maw Song. The track is transfixed on tribal rhythms and sweeping melodies to carry it. What makes Maw Maw Song work is it contains some of the best guitar noodling ever put out by the band and creates a thunderous atmosphere that is anthemic. 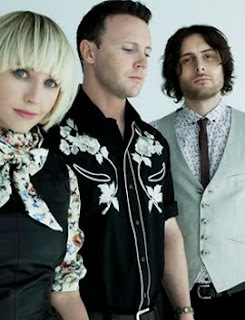 The track proves that although the Joy Formidable is more polished, they aren't any less experimental. If you ever wondered what metallic prog might sound like if it were played by an alternative pop-rock trio, then Maw Maw Song is probably it. It's also likely to become their biggest callout song on tour. Also under reviewed is the hidden track Wolf's Law, which cuts in on the closer The Turnaround. For me, it was one of the most smashing moments on the album and probably a mistake to bury it. Wolf's Law deserves to be its own track and the video makes it right. Forest Serenade and The Hurdle both tap some sounds from the band's earlier stylings without as much grit, making for solid bookends for the spiraling six-minute anthem The Leopard And The Lung. Plenty of people have called it a favorite and then deliver oddball criticisms, claiming it's too long. Any shorter and the atmosphere of it would have never materialized. Period. Wolf's Law By The Joy Formidable Breaks 8.8 On The Liquid Hip Richter Scale. You know a brand is headed in the right direction when half the rabble is disappointed because it's not hard enough and other half is lamenting that it could have been harder. True, I miss the dirt too. But in the greater context of their repertoire, the Joy Formidable has only sharply added to its tenacity and its addictive live performances. Wolf's Law by the Joy Formidable is available on Amazon and can be downloaded from iTunes. For added richness, consider the vinyl version from Barnes & Noble. The band is currently touring in Europe with plans to hit the United Kingdom in February and the United States in March. Check schedules via Facebook.